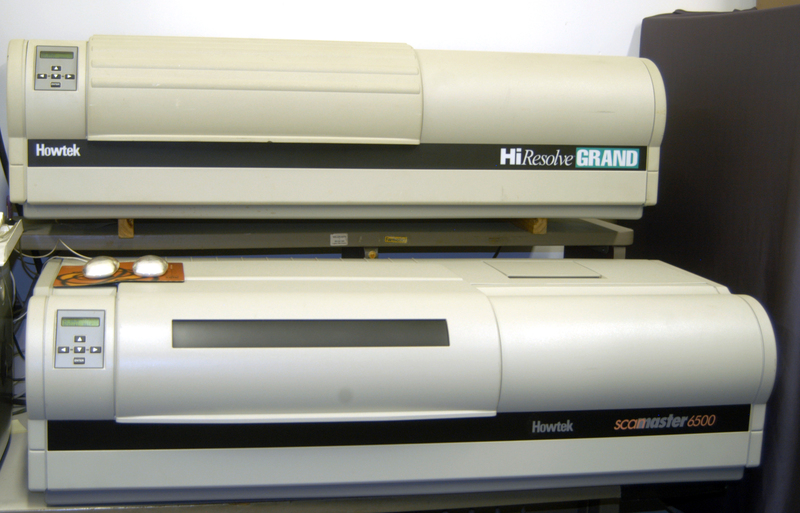 I have four Howtek drum scanners at my studio in Portland, Oregon. I charge $30 per scan for any size or type of original. For large projects of over fifty scans I usually bid a flat rate. Cost includes basic processing and electronic delivery. Fluid mount eliminates most scratches and dust spots. High resolution scanning done on a drum scanner isn’t just slightly better than other types of scanners; its an order of magnitude better in terms of resolution, sharpness and depth. That’s about what you would expect when comparing a $30,000 machine to one that cost less than a thousand dollars. If you are looking for publication quality scans, you can’t do better than a drum scan. If you want National Geographic quality, you need to do like they do and use a drum scanner. I have a substantial amount of experience scanning negatives and transparencies dating from the nineteenth century to the present including; Kodachrome, Fujichrome, Polaroid 55-P/N, Nitrate in sizes up to 11×14″. I’m experienced making book-quality reproductions of color transparencies. I can drum scan 16×20 prints with no problem. Compare my service to other companies. But make sure whomever you are comparing actually has a drum scanner. There is another studio in Portland offering drum scans who does not have a drum scanner. When questioned, will tell you they have a “virtual drum scanner.” What is that? That is an Imacon brand scanner that mounts the film in a curved shape, hence the marketing slogan ‘virtual drum’. Ask the vendor what brand of scanner they have. Don’t be fooled, Imacon scanners share all of the disadvantages of ordinary scanners and none of the advantages of a real drum scanner. 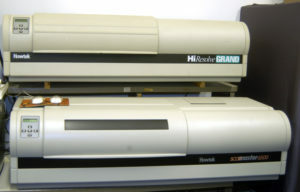 The difference is that real drum scanners use a PMT tube (photo-multiplier tube) to see the image. The Imacon, Nikon, Cannon, Epson, etc., scanners use CCD sensors (charge coupled device). And it is impossible to realize the benefits of a fluid mount with an Imacon. Customer Review: I scanned 104 prints for Jonathan Brand’s photography book being published by PowerHouse Books in New York. In November 2016 they had submitted a sample print for scanning here, as well as the same print to another local scanning house. On February 6, 2017 the photographer’s daughter informed me “Everyone was very impressed with the quality of your scan. The publisher at PowerHouse Books said it showed more detail than the scan done by your competitor.” (PushDot). Cost includes removing 35mm film from slide mounts and replacing them with a new Wess mount. CDs are $3 each. Film can be picked up and dropped off during business hours, or can be mailed. Postage for returning film is $3 for the postage and mailer. I have a SAMS number and am currently enrolled in the award management systems of the the National Park Service, University of Washington and the University of Oregon. If you are coming here to deliver, go to SE 17th & Harney. I’m in the building behind the Arugularium restaurant. If you have any difficulty finding me, just give me a call and I’ll walk out to meet you. If you have questions, please call 9-5 Pacific Coast time. Please give me a phone call when you ship something so I can be on the lookout for it. Please package well in a cardboard box. Feel free to call with questions. I need both your address, phone and email.